Hardly a day goes by without an announcement or news story about energy. Much of this attention tends to focus on households. It is far rarer to hear about energy in the context of small businesses and the challenges they may face. And yet for many small businesses gas and electricity are significant running costs. Falling into arrears on an energy bill is not only a difficult experience in itself but, if unresolved, can result in a business closing down and ceasing to trade. At Business Debtline we advised more than 30,000 small business owners in 2017. A considerable proportion of these had energy arrears. From what our advisers hear on a daily basis, we recognise the broad issues many small businesses face in relation to energy. We have worked hard to engage the energy sector and to build good relationships with many suppliers and the trade association, Energy UK. However, we felt insight was needed to gain a better understanding of this area.  To inform our work we commissioned research from the Personal Finance Research Centre at the University of Bristol to explore in greater detail the impact of energy debt on the lives of those people who have contacted Business Debtline. 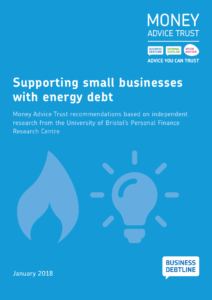 The research, Supporting small businesses with energy debts, published today, along with our own recommendations for the industry, regulator and government provides valuable insights into people’s experiences of setting up and running a small business; how they deal with finances and importantly their engagement with the business energy market. The businesses featured in the research were invariably ‘microbusinesses’. They often were very small, with limited turnover and few or no employees. They included newsagents and convenience stores; cafes, pubs, and food outlets; landlords, hairdressers and other personal service providers. All of them had taken advice from Business Debtline. Interviewees had limited engagement with the energy market. They seldom recognised it as a priority when taking on new premises and few made efforts to shop around and secure a good deal on energy costs. There appears to be very little difference between these small business owners and typical domestic energy customers in terms of skills and capacity to navigate the energy market. The root causes of financial difficulty naturally varied between interviewees. Poor trading conditions, changing consumer tastes and competition from larger businesses often played a role. Personal factors, such as illness, bereavement and the breakdown of personal relationships, also made a significant contribution – perhaps suggesting that suppliers need to be more aware of vulnerable situations among their microbusiness customers. Many of those interviewed lacked the financial and business-planning skills needed for their business to be on a firm financial footing. Energy-specific issues such as metering and billing, along with poor communication by suppliers, created issues for a number of interviewees. Several struggled after receiving ‘catch-up’ bills covering long periods of previous usage. Ofgem’s recent proposals to curb this practice are pleasing to see and may go some way in addressing this issue. On negotiating with suppliers and taking advice, interviewees reported mixed experiences. Some were unable to reach an arrangement and found their supplier unhelpful or uncommunicative. Yet in many cases it was an energy supplier that signposted customers to Business Debtline for advice. Crucially, in these examples, breathing space from the debt/s was often provided to give the business time to resolve the issue. Positive as this was, it often came at a relatively late stage, after a crisis point had already been reached. Improving the information available to small businesses, to help them understand their rights and to navigate the energy market. Taking individual circumstances into account. Suppliers could do more to consider the needs of small business customers and Ofgem should review existing protections and consider additional protections for those most susceptible to detriment. Improving signposting to Business Debtline by focusing on earlier intervention and promoting use of online and web chat channels. Broader small business support. We make a number of recommendations for government and other stakeholders to bring together existing sources of support and do more to help small business owners acquire the skills and knowledge they need to make a success of their businesses. Over the coming months we look forward to working with energy suppliers, trade associations and other stakeholders to discuss the implications of this research and our recommendations. Read the full Supporting small businesses with energy debts report and the Trust’s recommendations here.